So for like a month I barely watch any films with the intention of reviewing them because I got to experience the glory of witnessing my favorite sports franchise win their first championship in over a century, and this is what I settle on for my return to putting down words. 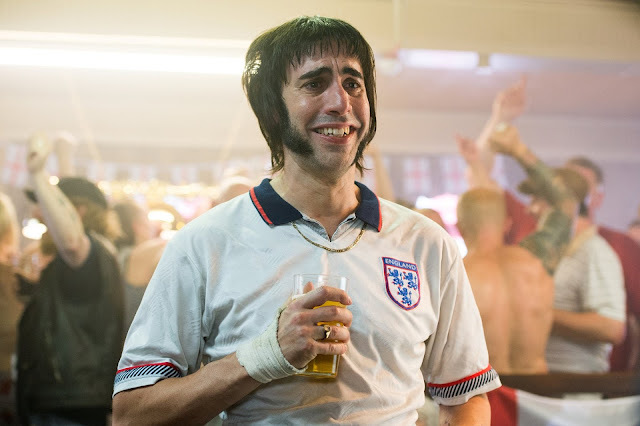 Both written by and starring Sacha Baron Cohen, the new comedy The Brothers Grimsby is brutally unfunny and boring, which is almost hard to believe considering it's only 80 minutes long and tries so damn hard to be shocking with its gross out humor. One would think at the very least it would keep my attention, even if it was for all the wrong reasons. One would be wrong. Directed by Louis Leterrier, who was also behind the camera for one of my least favorite films of a few years ago, Now You See Me, The Brothers Grimsby misses the mark on every single occasion. Every one of them. I not only couldn't laugh, I couldn't smile. I couldn't sit in one spot and watch it for its entirety because I felt like I have this one life to live and I was just giving away time for nothing. I started cleaning up my living room a bit as this was on so I could feel like I was accomplishing something to offset the awfulness. Nobby (Sacha Baron Cohen) has been searching for his brother Sebastian (Mark Strong....why Mark? Why did you do this film?) for 28 years. He finds him. Sebastian is an MI6 secret agent uncovering a plot that threatens mankind. Hilarity ensues. That's all I've got, providing a plot summary is like reliving the movie all over again. The four worst films I have seen from 2016 are all terrible comedies. Five if you include The 5th Wave, but that wasn't trying to be funny. There is nothing worse in cinema than cringing through over an hour of comedic material that never lands, and The Brothers Grimsby and the three films worse than it all fit so perfectly into that unfortunate category. I find modern comedies to be difficult to watch only because you can tell that they're trying to hard and failing miserably. Sadly, I think it's mostly because studios just don't know what makes a good comedy. It's movies like this that make me wish that modern comedic filmmakers would look and learn from classic comedies. I mean, there has to be a reason why those jokes have lasted decades and are still funny while modern comedies are forgettable after a day. It just boggles my mind when it comes to comedy films. Sorry it has been a bit since I have replied to any comments Cody. Fell behind on writing in general for a while, holidays, all that stuff. I completely agree with what you said. It's amazing to me how funny some films can be going back all the way to the 20's, how the silent era was able to master the art of slapstick humor yet decades later people have no idea how to execute it. Moving ahead to my life time, to the comedies I grew up loving, rarely does anything released during recent years feel like it has even close to the potential to still mean something years from now, to still resonate with audiences down the road.